The quest for a state championship begins in the youth ranks and for decades, the Mat Cats program has introduced the rough and tumble sport of wrestling to Chewelah’s youth. 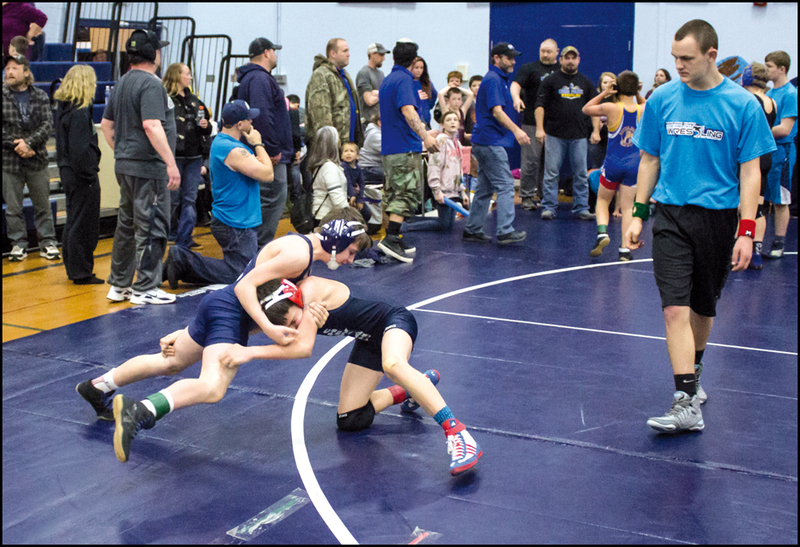 During the youth wrestling season, many towns host annual tournaments that bring kids from all over to do battle and this weekend will be our turn to host the masses. Pein-Lynch Gym at JJHS becomes a literal madhouse as hundreds of wrestlers take to two mats. This Saturday, March 23 beginning at 9:30 a.m., the annual Mat Cats tournament becomes one of the busiest events at the school and brings hundreds of people from outside Chewelah. For the Mat Cats parents, it means a lot of work to pull off this event which is completely a volunteer function. “It takes a good month to prepare, we have a board meeting in the beginning of February where we assign parents with jobs,” said Mat Cats parent Tamara Olshefski. Parents have to work on getting ref shirts made, collecting donations for their fundraising raffle, contact vendors to sell apparel at the tournament and finding members of the community to help with food, being head refs and medical staff. “We have a group of board members and parents who go shopping for our wonderful breakfast and lunch food,” Olshefski said. Parents also help with registration, sign-up, weigh-in working the pairing room and manning the bracket. There is also setting up the mats and and scoring tables. When it comes to events, while this one may go under the radar for most, it does bring hundreds of people to town, and with that comes increased business. Not many other events, save for the biggest on the Chewelah calendar, bring in as many people. The tournament will start early with weigh-ins going from 7-9 a.m. before wrestling begins at 10 a.m. This is the most labor-intensive tournament for Mat Cat parents, but its not the only one. Once the season is finished, they will have wrestled in six tournaments. So why go through all of this? Mat Cats, along with other local youth wrestling programs teach kids the fundamentals of wrestling. With it being an invididual sports, the Mat Cats coaches has also set out to teach individual responsibility and off-the-mat lessons as well. With the Chewelah program consistently bringing home state wrestling medals in high school, it’s easy to see how the Mat Cat program is succeeding in more ways than one.